The Warner Grand Theater, a movie palace from the grand old era of movie palaces. Grand show cases for audiences who were starving for entertainment and escape during hard times. They were extravagant, they were plush they were grand and they were a fantasy place to shut out the outside world while the audience visited many and varied worlds presented to them on screen or on stage. The Warner Grand is the last of the movie palaces to remain as it always has been. Two other Warner Brothers owned palaces have been either altered or are gone. The man who designed the Warner Grand also designed the famous Pantages Theater as well. Still an active theater venue even today in 2017, movies are still seen on the silver screen and live performances are given on stage. Of course you are visiting a website, mine, that deals in the paranormal and my interest in this lovely edifice and her cavernous world within her walls are those who may have once worked here or performed here or were paying customers here. Ghosts is what the Warner Grand Theater is all about to me. Stairway to Heaven? 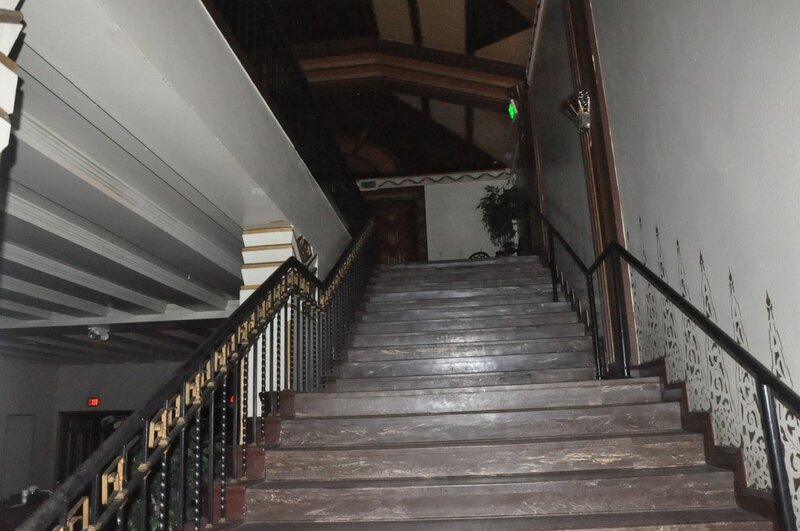 Maybe, but certainly a stairway to a spirit world unlike many others within haunted Southern California. Many investigators over the last 8 years have traversed these stairs and the balcony and lower auditorium. Many have wondered the projection room above and the dressing rooms below the main stage. The stage, the dressing rooms, the hallway by the dressing rooms, the auditorium seats and the balcony seats have all had their stories of the supernatural. Ghosts felt, ghosts seen, ghosts heard. One well known medium speaks of the spirit of a female performer on stage. 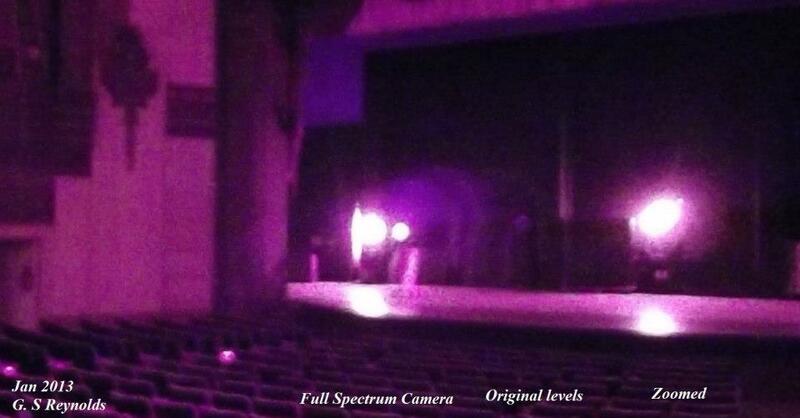 From one of my investigations four years ago in 2013, taken with a full spectrum camera, if you look to the left side of the stage you see a figure in almost white that appears to be human shaped on the stage. It appears to be female and perhaps wearing a long dress. There was nobody on stage when this photo was taken and certainly no women who would have been wearing a period dress. Is this the spirit on the stage first told to me by Tuesday Miles, well known Southern California medium? Here is a zoomed in version of the above photo. The lady on the stage? Clearly the shape is human. Clearly female and in a beautiful dress. She appears to be in the midst of giving a performance doesn't she? No, I did not see her with my own eyes when I was taking these pictures. These photos were random and were not reviewed until the next day. Free Free Free, So said the Ghost as He Escaped by Me. 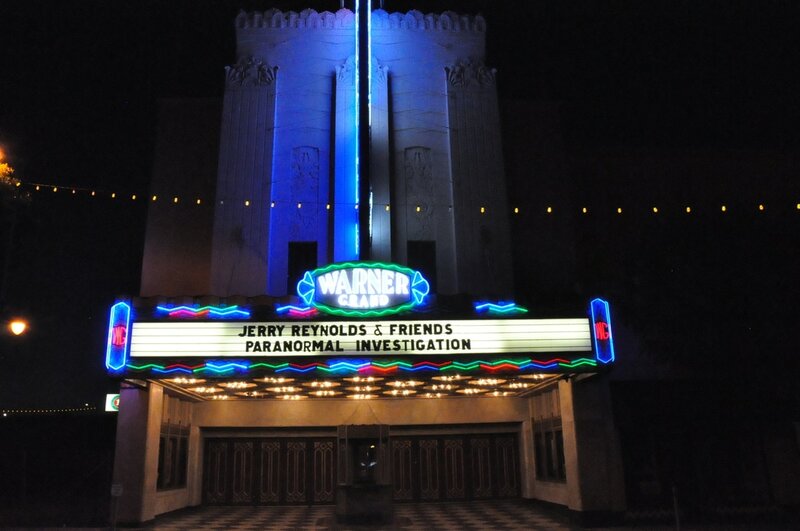 May of 2009 was my second investigation at the Warner Grand. 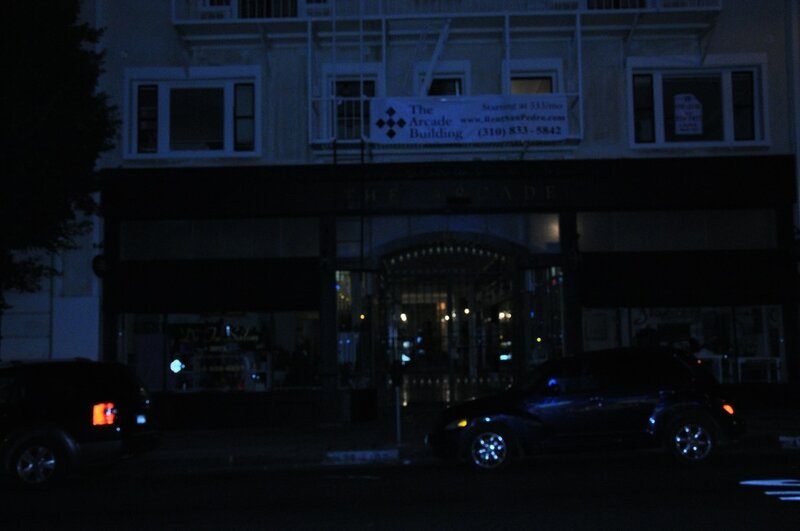 I was with the San Diego Ghost Hunters on this night. On this night I had my Sony camcorder with night vision and I set it up as a stationary camera in the hallway by the dressing rooms under the main stage. This picture is is the original screen shot from the video I recorded. I use to do a frame by frame review of my videos to see if I captured something on one of the frames. 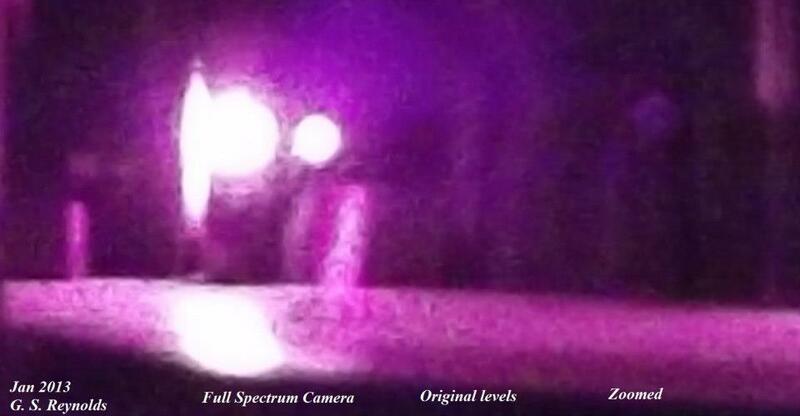 My theory was that ghosts may vibrate at a higher rate, a higher level and when they do appear on film its only for seconds due to this higher rate of vibration if you will. And so I discovered this image. A one time friend of mine who was a tech guy and a total skeptic poo poohed this but the image is unmistakable. A young woman, with her hair styled and she is wearing a black formal dress and she has on white pearls and matching ear rings and she is smiling at me and my camera. Like she is posing. 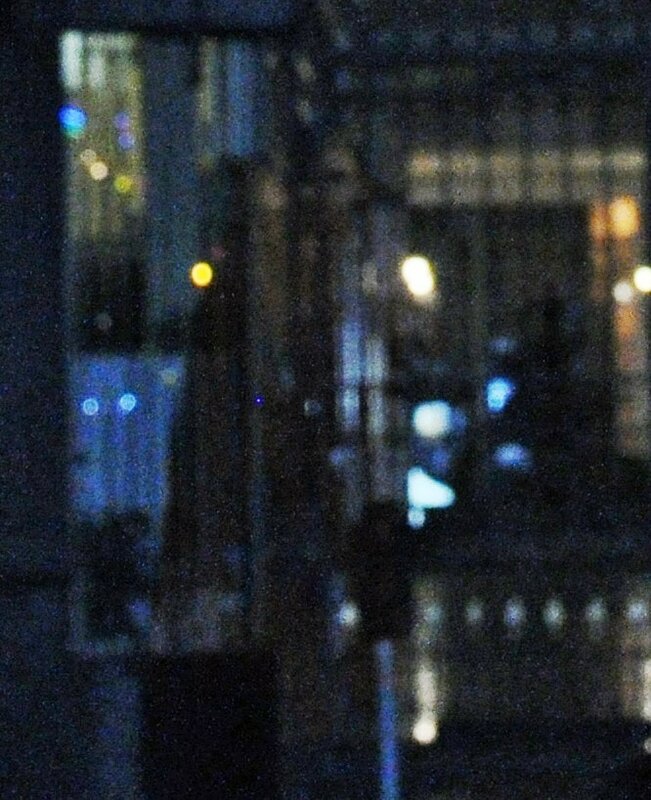 Here I have lightened the frame and you can see her even clearer. She is a beautiful woman with a beautiful smile. Here I have colored her in sepia tone to make her image standout. 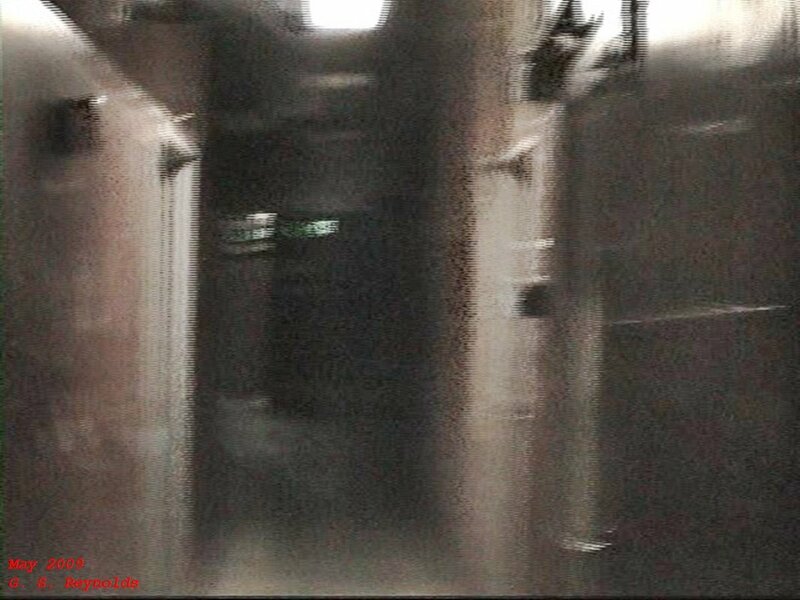 During a recent investigation KD Foreman a fellow investigator and medium told me of a female spirit who had said there was somebody in our group whom she had talked to many times. I have been at the Warner Grand investigating I would say at least eight times since 2009. Three such investigations I have arranged myself. Below here is the video from which this frame capture as taken. It has been slowed down many times so that perhaps if you pay close enough attention you can see her forming just as I turn into a small dressing room to the left. I kick myself and wish I had held that hallway on camera just a little longer. In March of 2009 I was invited for the first time to the Warner Grand to hear Tuesday Miles and she was also demoing a new paranormal tool which I do not even remember what it was. I do recall it was a multiple faceted tool that collected varied data but I do not think I've seen it since. Sharon Coyle who was a good friend of mine and the found of a paranormal meet up group invited me along this evening. Sharon now lives in the state of New York where she owns and operates a place you may have seen on television known as "Rolling Hills Asylum". It was prior to this little meet up that I was parked outside the theater by the "Arcade" building which is just directly across the street from the theater. I was taking some street pictures with my Nikon D90 which I have had for nine years now and this camera has never failed me. Its a wonderful instrument. I took this random photo of the Arcade building with my Freestyle parked in front and I looked at my viewing screen afterwards and couldn't believe what I thought I was seeing. It wasn't until a couple days later that I confirmed the image. First of all let me tell you that there was nobody on the street in front of the Arcade building when this photo was taken but, there they are. People! Wearing clothes that clearly is not of our time. Maybe more like the 1800s but not 2009. No way! A man with long brown hair and perhaps a beard facing me directly and next to him, two women in what can only be described as long flowing black dresses and some kind of hats or hoods? Covering all of them except their faces. Almost like you see women in the middle east. Maybe clothing that was designed for religious beliefs . This first photo is the original with the original distance. As you can see, I am across the street from what you are seeing in this picture and its about 7:00 PM in the evening and its dark looking. My camera has a back lighted viewing screen so I could see the images you are about to see in the next versions of this photo. This photo has been lightened and here in the red box you can see the images I was seeing. Next is a zoomed in close up of these street people as I call them. If you were able to look closer at these images, you would see the man to the right looking directly at me. Next to him, just in the middle appears to be a female who is being assisted by him and even more to the left another female who is closest to the street. You can see the profiles of the women and you can see by their dress they are covered head to toe. Perhaps for religious reasons. I don't know but, the style of clothing as you can see is not of this time. Who are they and why at this time did their images appear? Haunted 6th street? I have tons of EVP and ITC capture from the Warner Grand that I realize some of my best stuff is on external drives from times in past years that I backed up my computers. I will have to search them and down load the best so I can post them here for your viewing and listening pleasure. They are truly amazing captures and you will see them in the future days to come but at this time I'm going to display some of the captures from our recent investigation of June 24, 2017. Truly amazing stuff. Let me start with this most starting ITC captures from the Sunken Lobby of the Warner Grand. It seems to be true. The more you investigate one location the chance is they will get to know you and know you by name. On this night, this investigation such a thing happened to me. Fellow investigators Rob Hernandez and Erik Vanlier and I were in the Sunken Lobby of the theater. Some refer to this location as the Sunken Smoking Lounge. 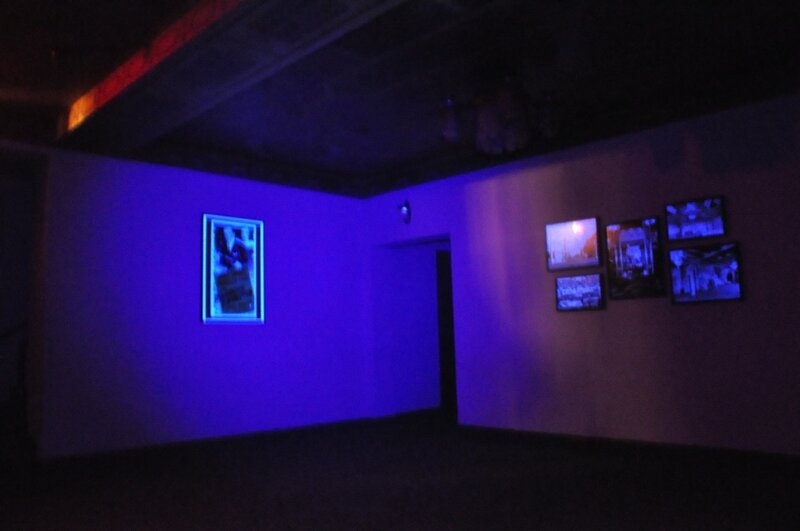 This area may be the most active part of the theater. Many investigators, some with intuitive abilities have connected with this room. Many and varied reactions to the Sunken Lobby. Many and varied souls abound here. That door you see to the right is the entrance to the women's restroom. It is said there is a dominant female spirit that stands in that door way. Out of the picture and to the left at the otherside of the Lobby is the mens restroom and it too has had activity but, she, the lady of this room you see here is strong and always there. However on this night I'd connect with a male spirit who was very much aware of who I am and knew me by name but, he says I don't know him now. Take a listen and see what you think. The most entertaining part of the evening took place in the main dressing room under the main stage. We did an ITC session utilizing the RTC amplifier / speaker designed by fellow investigator Rob Hernandez. Founder of PCH Paranormal. While having sensors of its own the RTC Box has the ability to work as a speaker / amplifier and to filter out white noise. The RTC Box facilitates some of the most clear responses I have heard while using it at various locations. On this night the spirits and the box provided great entertainment as they seemed to take an interest in fellow investigator Erik Vanlier. His reaction to this communication was quite entertaining as well. These are real captures folks. This male spirit was having a good time teasing Erik and it did not seem malicious but of a very good nature. She is an art deco masterpiece from 1931. A time from which art deco was highly celebrated. Just ask those who love the RMS Queen Mary in Long Beach California. The Queen had her maiden voyage in 1936. Just five years after the Warner Grand opened her doors. The Queen Mary was another tribute to art deco as well. In a sense this theater and the grand ship are sisters. As they share and represent a piece of history we shall never see again. Both are very haunted. ​The Warner Brothers, Albert, Sam, Harry and Jack Started their movie company in the early 1920s. They were the first to bring us the talkies. Movies with sound The very first such movie was "The Jazz Singer" with Al Jolson in 1927. The Warner Grand Theater was the first sound equipped theater in the South Bay and opened its doors in 1931 just about 3 years after the Jazz Singer was on the big screen. For even more history and information about the Warner Grand please visit the GRANDVISION Friends of the Warner Grand website at. Look for more of my haunted experiences at the Warner Grand to be posted in the weeks to come.